This article is about the year 1801. For the microprocessor, see 1801 series CPU. Wikimedia Commons has media related to 1801. January 1: The United Kingdom of Great Britain and Ireland is formed. The legislative union of Great Britain and Ireland is completed under the Act of Union 1800, bringing about the United Kingdom of Great Britain and Ireland, and abolition of the Parliament of Ireland. Giuseppe Piazzi discovers the asteroid and dwarf planet Ceres. January 3 – Toussaint Louverture triumphantly enters Santo Domingo, the capital of the former Spanish colony of Santo Domingo, which has become a colony of Napoleonic France. January 31 – John Marshall is appointed Chief Justice of the United States. February 9 – The Treaty of Lunéville ends the War of the Second Coalition between France and Austria. Under the terms of the treaty, Aachen is officially annexed by France. February 17 – An electoral tie between Thomas Jefferson and Aaron Burr is resolved, when Jefferson is elected President of the United States and Burr Vice President by the United States House of Representatives. February 27 – Washington, D.C. is placed under the jurisdiction of the United States Congress. March 4 – Thomas Jefferson is sworn in as the third President of the United States. March 10 – The first census is held in Great Britain. The population of England and Wales is determined to be 8.9 million, with London revealed to have 860,035 residents. 1.5 million people live in cities of 20,000 or more in England and Wales, accounting for 17% of the total English population. March 14 – Henry Addington becomes First Lord of the Treasury and Chancellor of the Exchequer, effectively Prime Minister of the United Kingdom. 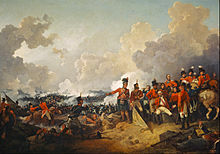 March 21 – Battle of Alexandria in Egypt: British troops defeat the French, but the British commander, Sir Ralph Abercromby, dies later of a wound received in the action. March 23 – Tsar Paul I of Russia is murdered; he is succeeded by his son Alexander I.
April 2 – War of the Second Coalition – First Battle of Copenhagen: The British Royal Navy, under Admiral Sir Hyde Parker, forces the Royal Dano-Norwegian Navy to accept an armistice. Vice-Admiral Horatio Nelson leads the main attack, deliberately disregarding his commander's signal to withdraw. He is created a Viscount on May 19; Denmark-Norway is forced to withdraw from the Second League of Armed Neutrality. April 21 – Ranjit Singh is invested, as Maharaja of Punjab. May 6 – French Revolutionary Wars – Action of 6 May 1801 off Barcelona: British Royal Navy brig HMS Speedy, although outmanned and outgunned, captures 32-gun Spanish frigate El Gamo. May 10 – The pascha of Tripoli declares war on the United States, by having the flagpole on the consulate chopped down. June 7 – War of the Oranges ends: Portugal and Spain sign the Treaty of Badajoz; Portugal loses the city of Olivenza. June 15 – A bull breaks through barriers at a bullfight in Madrid, killing two people (including the mayor of Torrejón de Ardoz). and injuring a number of other spectators. June 27 – Siege of Cairo ends: Cairo falls to British troops. July 7 – Toussaint Louverture promulgates a reforming constitution for Santo Domingo, declaring himself emperor for life of the entire island of Hispaniola, and nominally abolishing slavery. July 12 – Second Battle of Algeciras: The British fleet defeats the French and Spanish fleets. July 18 – Napoleon signs a Concordat with Pope Pius VII. August 1 – First Barbary War – Action of 1 August 1801: United States Navy schooner USS Enterprise (1799) captures 14-gun Tripolitan corsair polacca Tripoli off the north African coast, in a single-ship action. September 9 – Alexander I of Russia confirms the privileges of the Baltic provinces. September 24 – Joseph Marie Jacquard exhibits his new invention, a loom where the pattern being woven is controlled by punched cards, at the National Exposition in Paris. September 30 – The Treaty of London is signed for preliminary peace between the French First Republic and the United Kingdom of Great Britain and Ireland. October 17 – A coup d'état is staged in the Batavian Republic. November 16 – The first edition of the New-York Evening Post is printed. December 15 – Hadži Mustafa Pasha, Ottoman commander and politician, is assassinated in Belgrade, Sanjak of Smederevo by Kučuk-Alija. December 19 – South Carolina College, a precursor to The University of South Carolina, is established in Columbia, South Carolina. 24 December – Cornish engineers Richard Trevithick and Andrew Vivian demonstrated Puffing Devil, their steam-powered road locomotive, in Camborne. The trial was successful but Trevithick realised the limitations of steam power in a road-running vehicle and turned his attention to rail, introducing the world's first steam railway locomotive in 1804. Philippe Pinel publishes Traité médico-philosophique sur l'aliénation mentale; ou la manie, presenting his enlightened humane psychological approach to the management of psychiatric hospitals. Translated into English by D. D. Davis as Treatise on Insanity in 1806, it is influential on both sides of the Atlantic during the nineteenth century. The magnum opus Disquisitiones Arithmeticae of Carl Friedrich Gauss is published. The Supreme Council, Scottish Rite (Southern Jurisdiction, USA) is founded within Freemasonry. ^ "Chronology of State Medicine". Archived from the original on August 9, 2007. Retrieved August 10, 2007. ^ Everett, Jason M., ed. (2006). "1801". The People's Chronology. Thomson Gale. ^ "Dreadful events in the front rows of the ring at Madrid and the death of the mayor of Torrejón, Plate 21 of La Tauromaquia". National Galleries of Scotland. Retrieved on 25 February 2010. ^ British Steam. Igloo Books. 2016. pp. 10–13. ^ Foucault, Michel (1961). Folie et déraison: histoire de la folie à l'âge classique.